Nitish Peela, a sophomore studying biomedical engineering, received a top ten award for his poster presentation at the American Association for Cancer Research (AACR) Annual Meeting in Philadelphia, Pennsylvania. Held April 18-22, the conference brought together researchers from all over the world to discuss and highlight the latest and most exciting discoveries in areas of cancer research—including treatments, diagnostics and prevention. It highlighted a portion of the research he conducts in Mehdi Nikkhah’s lab as an undergraduate researcher. Nikkhah is an assistant professor in the School of Biological and Health Systems Engineering, one of the Ira A. Fulton Schools of Engineering. “[In the Nikkhah Lab] we’re creating a physiologically relevant 3-D breast tumor model on a chip,” said Peela. “This enables us to conduct accurate controlled studies on cancer invasion and develop causal relationships between microenvironmental cues and cancer cell behavior,” he added. Another benefit of the research is its potential to reduce the necessity of animal models in cancer research. “Peela takes an active role in designing and independently conducting experiments and gathering biological data relevant to his project,” said Nikkhah. “He is eager to assist his colleagues in bringing their projects to fruition and he is a great contributor in lab meetings,” he added. 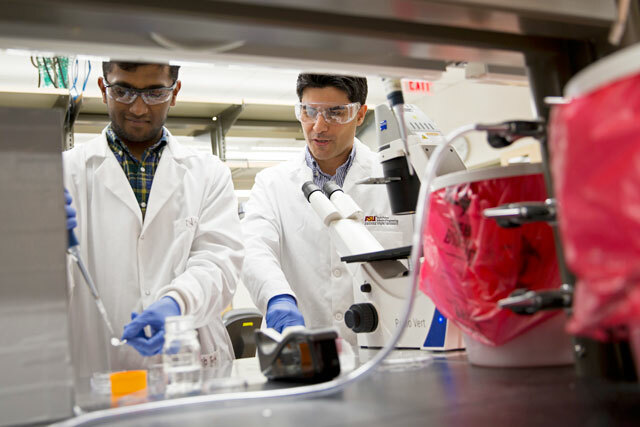 Peela’s research is supported by the Fulton Undergraduate Research Initiative (FURI)—a program that supports undergraduate student participation in research under the mentorship of ASU engineering faculty members. In addition to offering a research stipend, FURI fully funded Peela’s travel costs and conference fees. “From FURI I received valuable insight, motivation and funding to complete my research project,” said Peela. Peela said what he most enjoyed about the conference was its focus on implementing research in clinical settings. “It was inspiring to see scientists focus on translating research to a clinical setting in order to bridge the gap between cancer research and viable treatment options for cancer patients,” said Peela.